We should be eating my husband's favorite fruit, chico sapote, but I haven't seen it in the mercado for some months now. 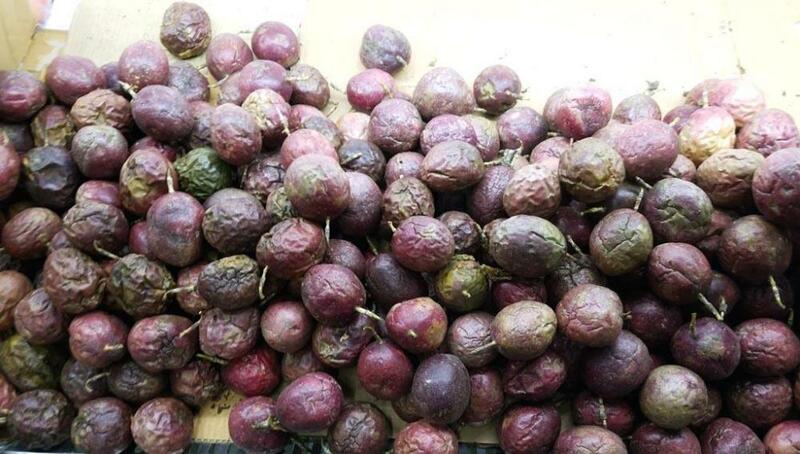 Nancy is chico sapote this fruit? I had never heard of it. I just love hearing about the foods available around the world and learning about them. Who knows, one day I may stumble on some of them in the many ethnic markets available here, and I will know what I am looking at, thanks to eGullet. 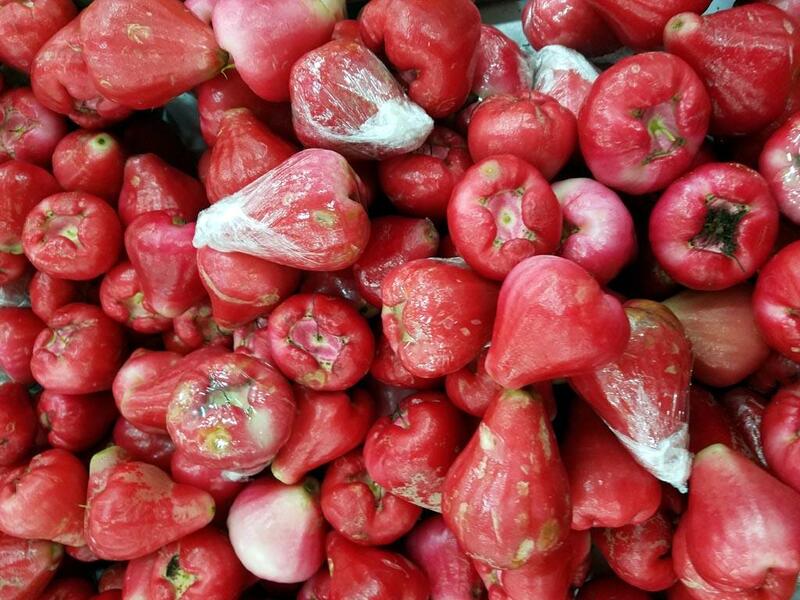 I still walk into my Indian grocer and am stymied by a lot of the produce, but other things that were unfamiliar to me, the good folks here helped me to figure out and enjoy. 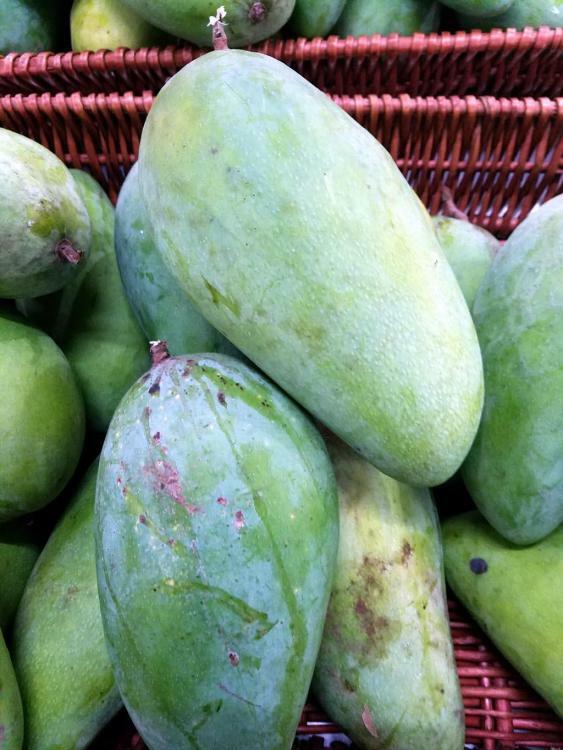 *Sigh* Mangoes at less than 10 cents a pound. It will never happen here. At least we can get them pretty much year round. They usually run about a dollar (19.58 pesos) a piece. I've never had passion fruit either, but I would love to and will be on he lookout for it. I don't know where I am. We have been driving all day. The driver doesn't know either. I think we are somewhere in northern Yunnan province. We stopped in some half-a horse village in the middle of nowhere* for some lunch (uninteresting, but sustaining noodles with unidentified frying objects) and as we were leaving I spotted a small fruit shop. This in itself is most unusual. 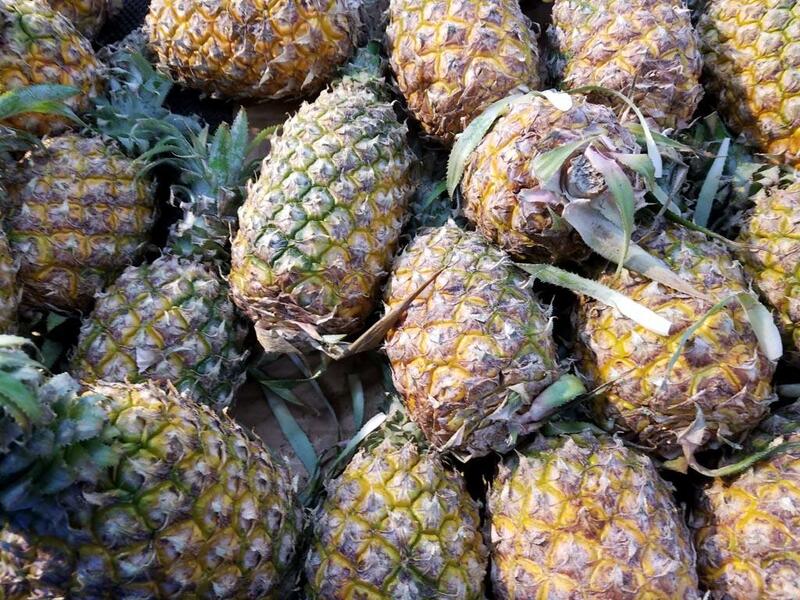 We get fruit from supermarkets or market stalls. Fruit shops are rare, especially in the countryside. 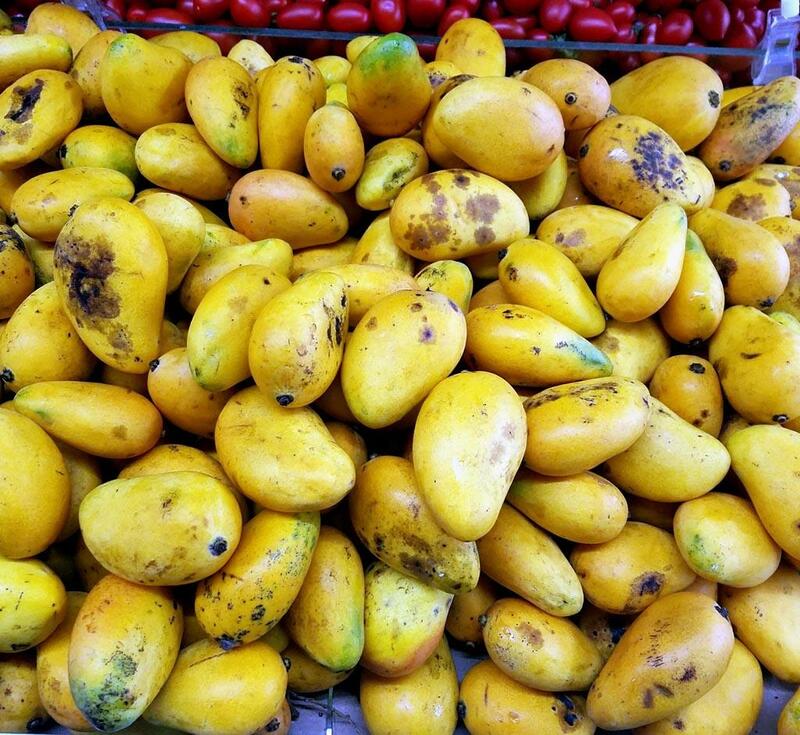 Small sweet mangoes. The equivalent of 65 cents per pound, @Thanks for the Crepes, but they will get much cheaper later to the point where they are virtually free. 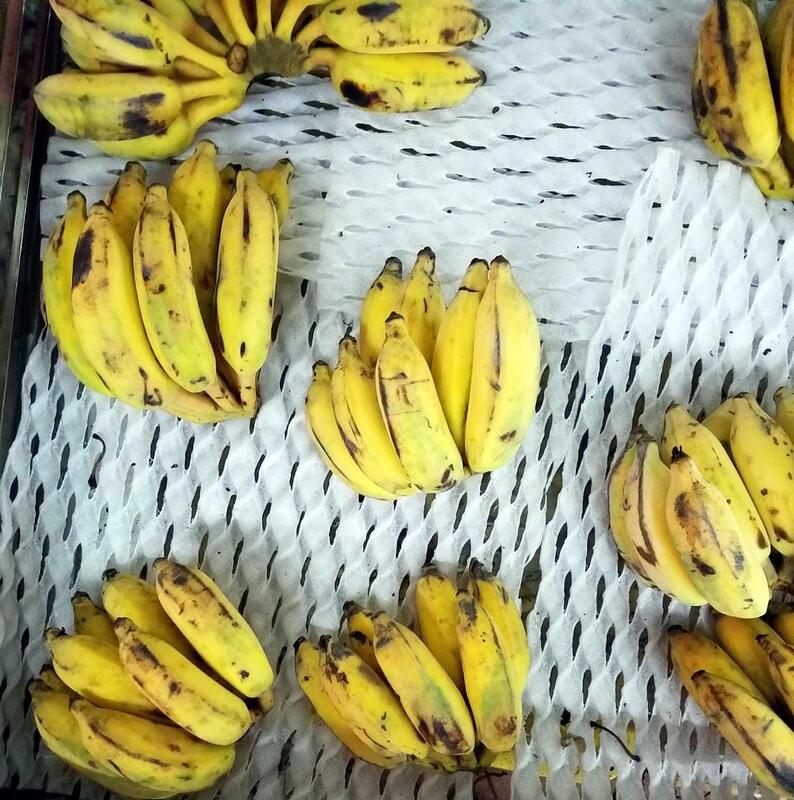 Small fingerling bananas. Well, that's what I call them. The Chinese is 米蕉 - mǐ jiāo which literally translates as "rice banana". I've seen it translated as dwarf banana, but I'm not sure. 米 - mǐ is often used just to mean small, though. They also had Cavendish bananas which is what I bought, and pineapples which I didn't. * I did ask in both the noodle place and the fruit shop where we were, but they didn't know either. Normal. Fruit in March? In Minnesota? Not even the shipped in stuff is any good. 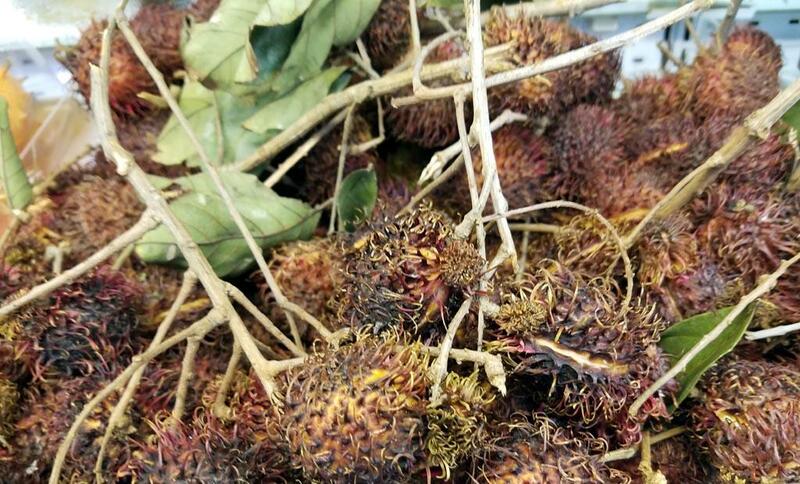 What is the method of identifying passion fruit's (preferred) level of ripeness? Give it a squeeze. They are like avocados in that respect. Hard one day; soft and ready the next. At least, that's my experience. The ones in my picture were ripe and ready. That wrinkled skin is also a bit of an indicator, but not foolproof. 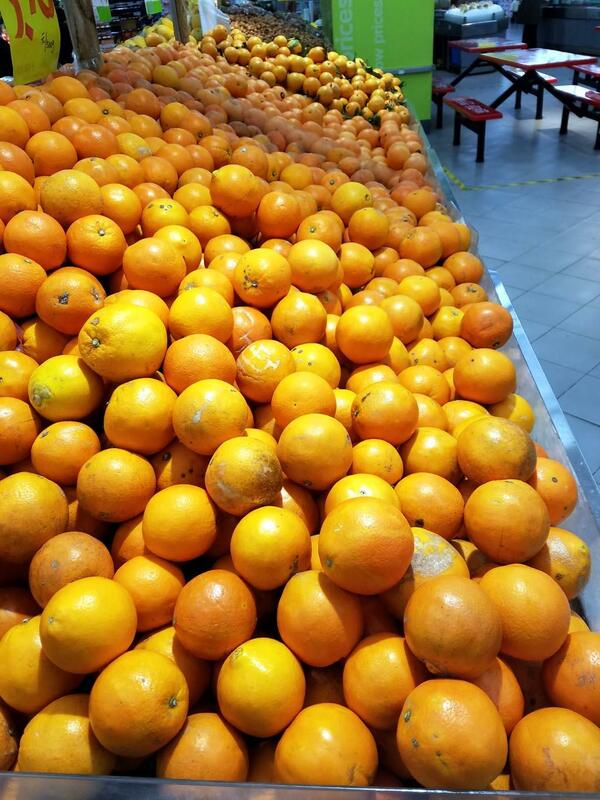 What's in season now is citrus...kumquats, ponkan (mandarin/pomelo cross, but quite small and fairly easy to peel. We eat a lot of those in season), a few boring late satsuma mandarin, and various other tangors and tangor/ponkan crosses. 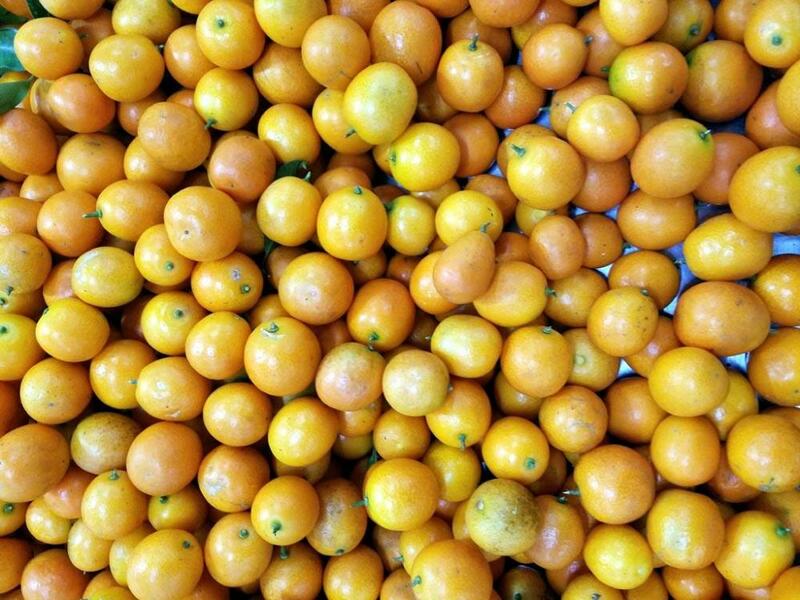 The amanatsu (type of natsu-mikan) start appearing now, and are pretty good for marmalade. Greenhouse/hothouse strawberries - they are expensive throughout the winter, but after Doll Festival (March 3) the price starts to drop rapidly, and we can really go to town on them! Apples - the conventional wisdom is that you shouldn't buy them after Doll Festival, because they are starting to get mealy. Loquats? Not yet!!! There used to be tree over the road, but the commercial varieties have more flesh. They definitely are something to peel and nibble at leisure. Imports - raspberries are easier to find now. 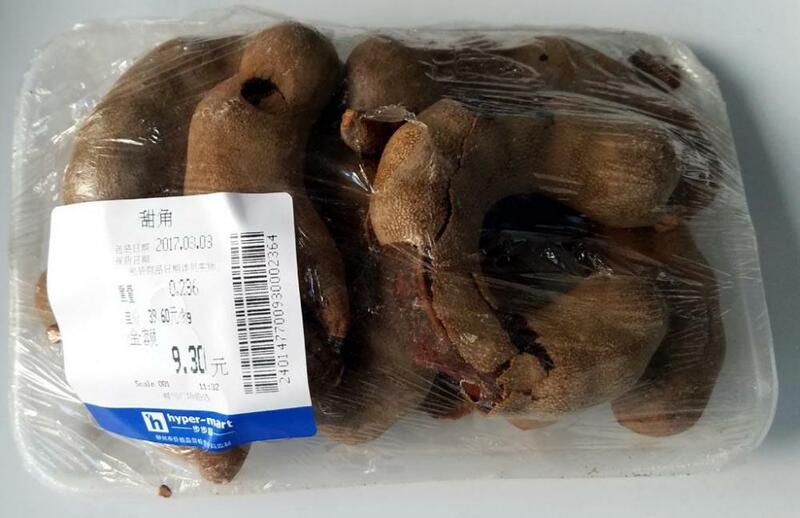 Once it gets hot, they go moldy so fast it is difficult to buy them. 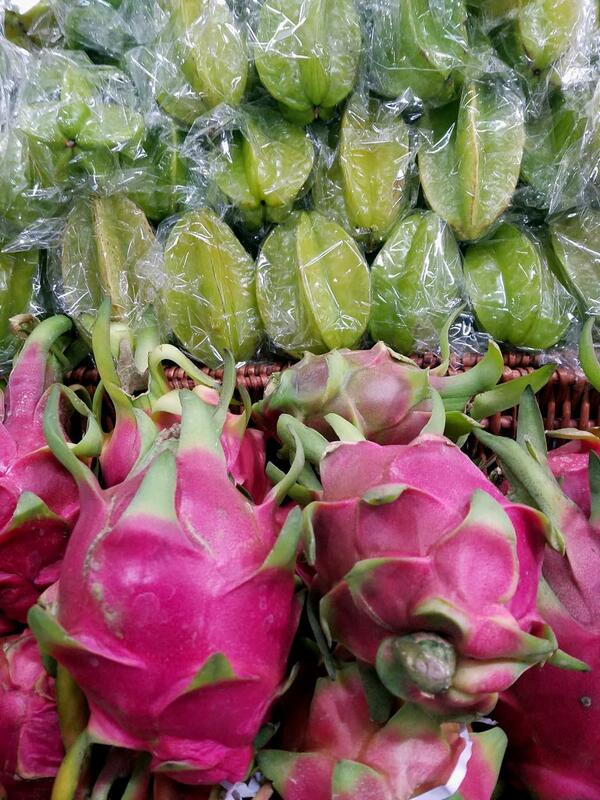 Dragonfruit, longan, mango, banana, and blueberries are imported year round, and recently we seem to get durian and green papaya fairly regularly, and even occasionally blackberries. Frozen mango and berries are fairly easy to find, and sometimes South American frozen fruit pulps (including passionfruit, yay!). Starfruit, babaco, passionfruit...never. When I first came to Japan (during the reign of the previous Emperor! ), fruit shops were basically places to buy expensive, huge, and not very tasty fruit to put on the family altar or give as gifts. Families shared one huge, glossy, tasteless apple for dessert. Only satsuma mandarins were cheap, and in fact the market was so glutted that foreign students used to eating more fruit ended up with orange palms from eating too many! I think the quality and availability of fruit in Japan has improved hugely. Nancy is chico sapote this fruit? Yep--the granular texture, the few black seeds, the color of the flesh all match. The tree is enormous. One time when we were driving toward Chetumal on the Belize border I stopped at a fruit stand on the side of the road to buy mangos. The proprietor showed me the chico sapotes and cut one in half. "It's like honey," she said, and she was right. It was love at first bite for my spouse. But as I said, usually I can find them at a couple of puestos in the mercado but not this year, at least so far. So we make do with the first of the mangos. It's a tough life. It has been a miserable day today. Not so cold, but it has rained since at least 5 am. It's now 5pm. Still raining. But out of necessity, I did pop out to my nearest supermarket. It isn't, by far, the greatest supermarket in town. But as a neighbourhood supermarket it is OK and occasionally surprises me. 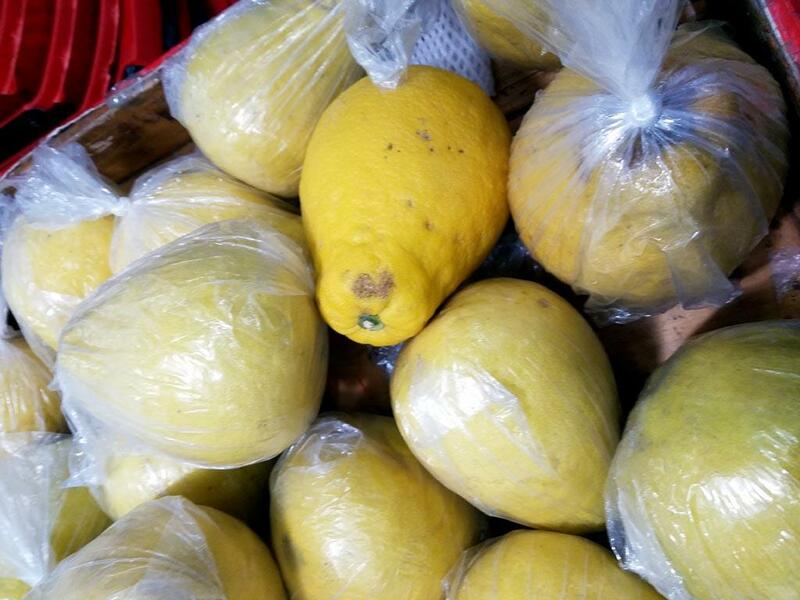 Pomelo. These are big news round here. 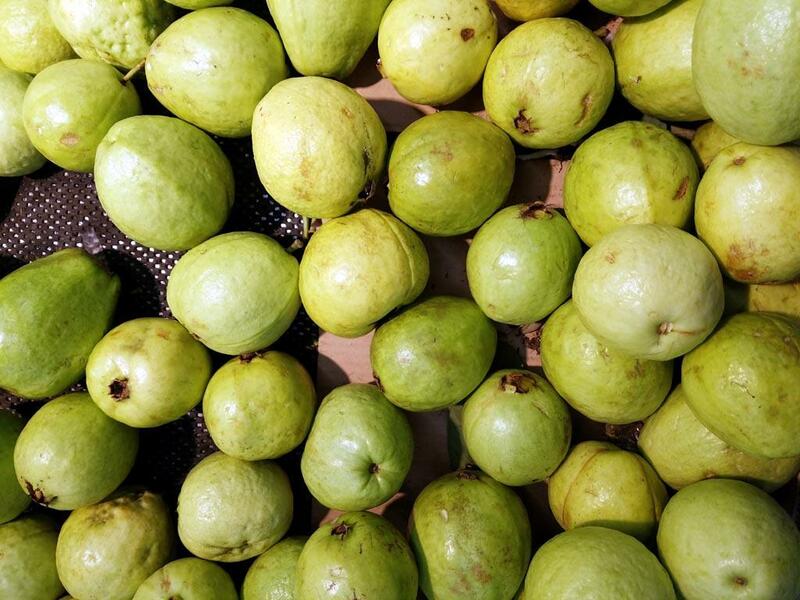 Pomelo central. There are farms all around which you can visit and, for a modest entrance, fee pick your own and eat as many as you can cram in. However, if you decide to take one home, then you have to pay top yuan. I guess most people buy from local markets. I never buy. They are so unpredictable. Usually dry and tasteless, but occasionally lovely. Water melon - well out of season and looking sad. There were also six different types of tasteless apples. Chinese apples seldom rise to the occasion. I'm sure I've forgotten something. If my brains finally recovers, I'll edit. "Wax apples" were new to me. Hurray for Google. Apologies. I meant to link to my blog on the topic, but forgot. Have edited. 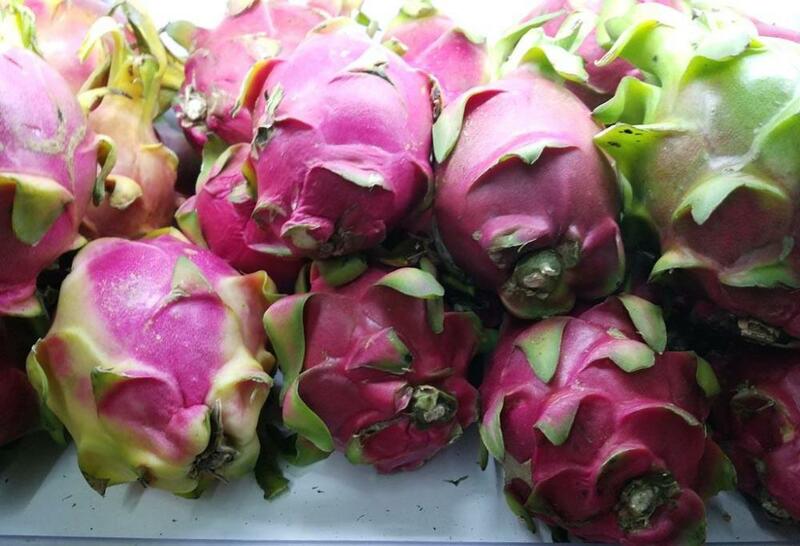 So they go along with starfruit and dragon fruit in the "pretty but bland" category? Yeah, I'd say so, but so do many other fruits. That said, I kind of like dragon fruit, especially the red fleshed variety. Those are hard to get in my neck of the woods, alas. Grapes - these were, I'm sure, imported. I'm waiting till summer when we get beautiful fresh grapes from Xinjiang province. They also had 7 different types of mangoes. Despite my not wanting any fruit, these found their way into my basket! Those are pomegranates?? They look unlike any I've ever seen. Please tell more about them. Are the green lemons green as in 'unripe', or is that their ripe color? Can you describe how their flavor might differ from that of standard sour (Eureka or Lisbon in the USA, not sure about in China) lemons? Yes. Those pomegranates baffled me when I first saw them. I've never bought any, but a couple turned up in a basket of fruit I was once given when in hospital (long time ago - nothing serious). They are, I think, unripe fruits. I'm not a great pomegranate lover at the best of times, but unripe isn't pleasant. I eventually managed to cut one open, probably forever ruining the knife I used. Inside I found hard inedible fruit. 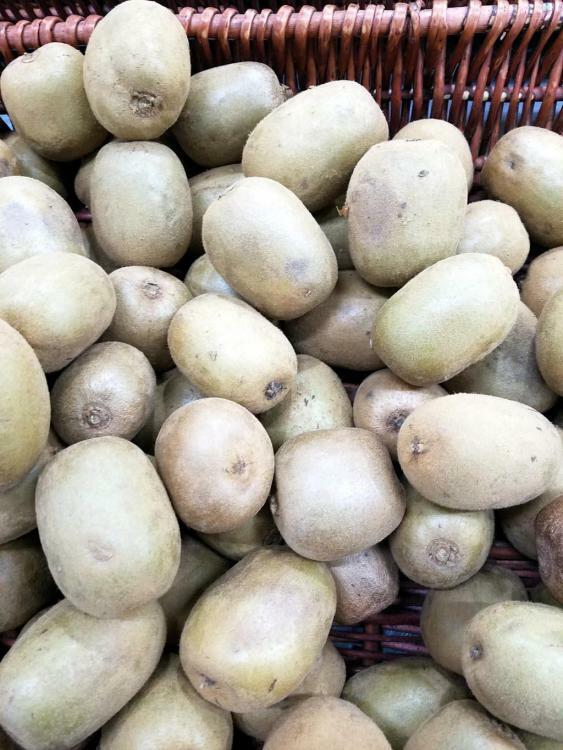 Perhaps you are meant to leave them to ripen on the counter avocado style. I've never had the inclination to ask or to try. We do get regular poms later in the year. I only remember buying any of them once, when I wanted the seeds for a specific dish. 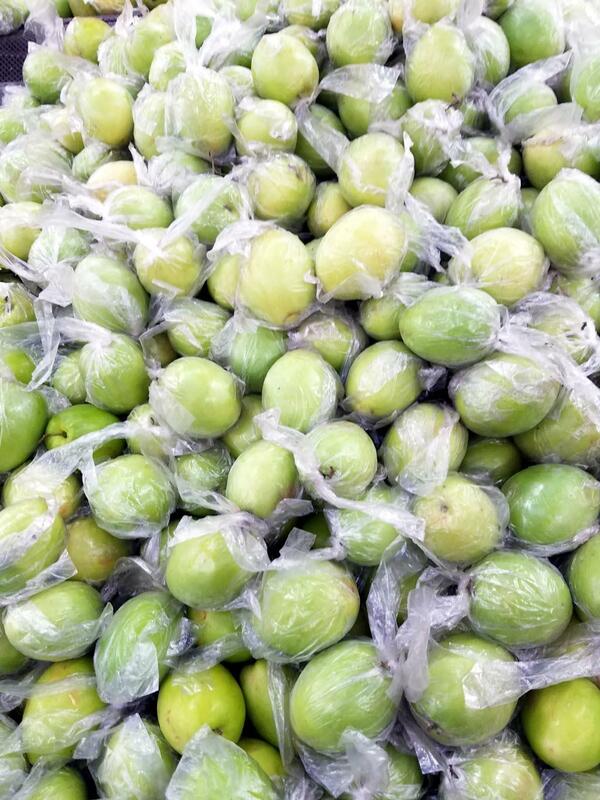 The green lemons are ripe. The flesh is yellow as normal. They have just turned up in the last year or so and we get several varieties. 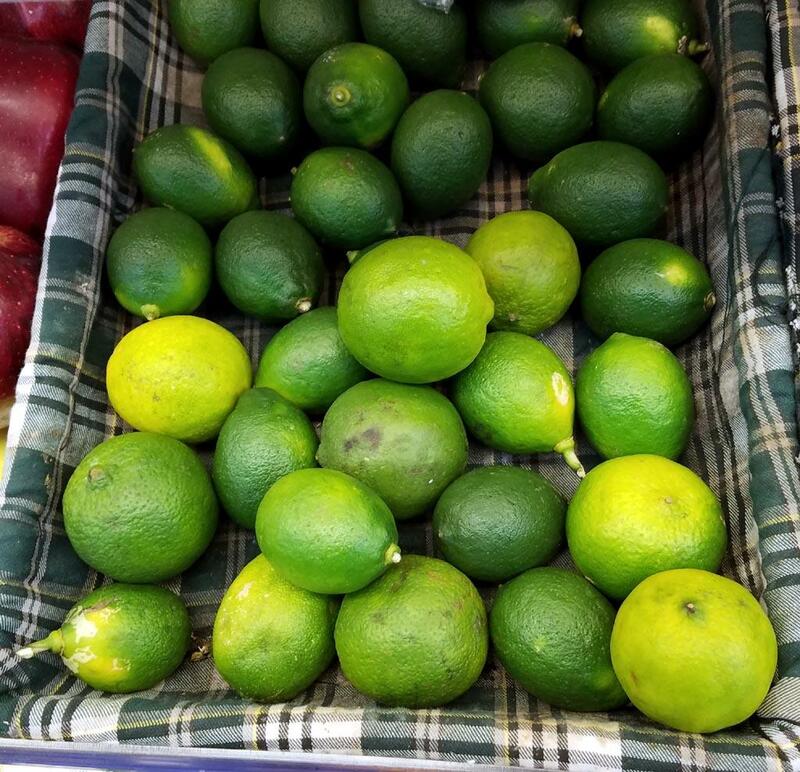 Unfortunately, they are NOT the limes I initially thought they were. (we only get those about once every time Jupiter and Venus align with the moon). Confusingly, the most common name for limes, 青柠檬 - qīng níng méng, is a direct translation of "green lemons" whereas the name for these is "green lemons"! We also get regular lemons, which is what I usually buy. Taste-wise, I can't detect any significant difference between them. P.S. 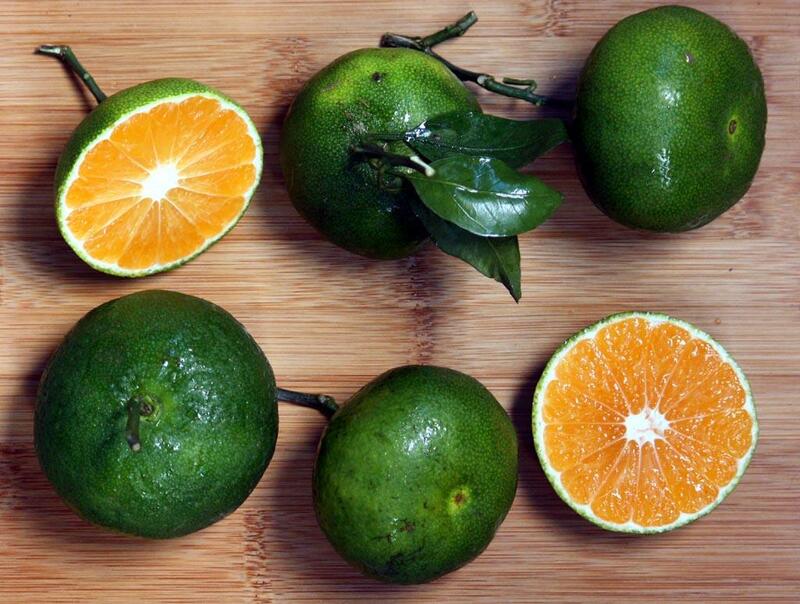 We also get lovely green oranges. I missed one item from yesterday's collection of supermarket images. In season? In Ontario? In March? NOTHING. That still counts as a fruit harvest, doesn't it? Nope. Icewine harvest long since past. @liuzhou, tell me about ginseng fruit, please. Is it from the same plant that yields ginseng root? 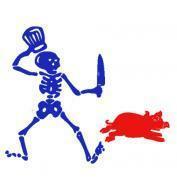 There is a link to my very short blog article on the fruit under the image. No, there is no connection to ginseng root. Those ripe ones look like little eggplants. Interesting and great material, as usual, liuzhou! 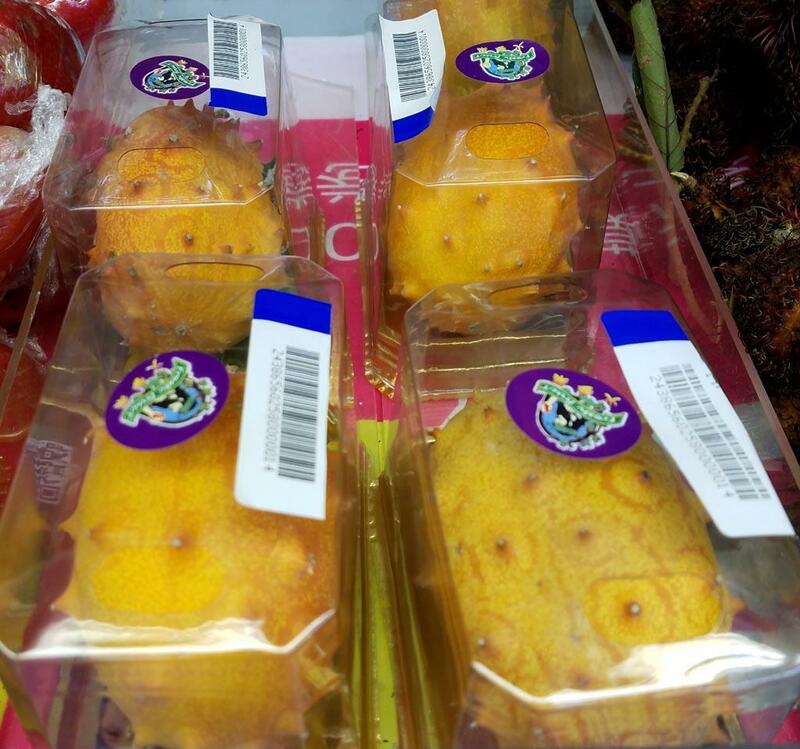 I was unable to find any helpful stuff on Google when I looked for more info on Chinese golden muskmelon. They remind me of these Korean melons I once found in my Korean-owned Pan-Asian market, I did not care for them much. I like cucumbers and I like sweet melons. The Korean melon I experienced was sort of a cross, and just didn't do it for me. It was exciting and interesting, nonetheless, because I had never had one before. 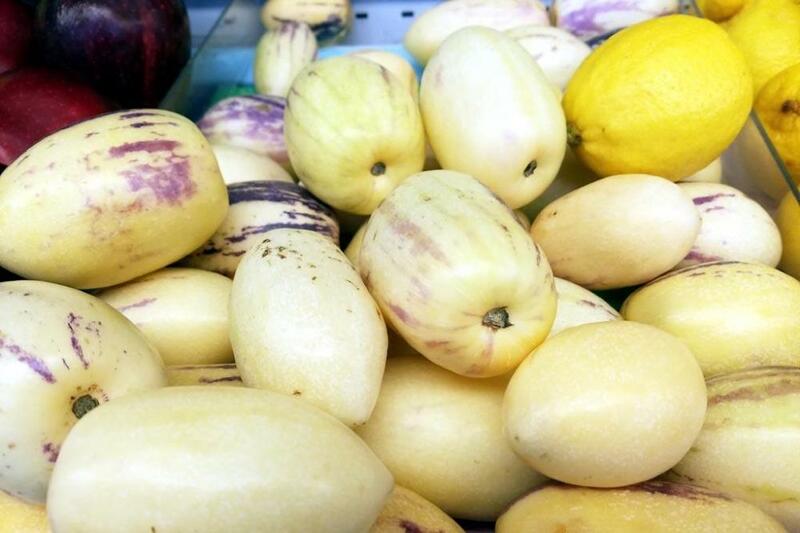 Have you eaten these Golden Muskmelon, and if so, what do you think of them? 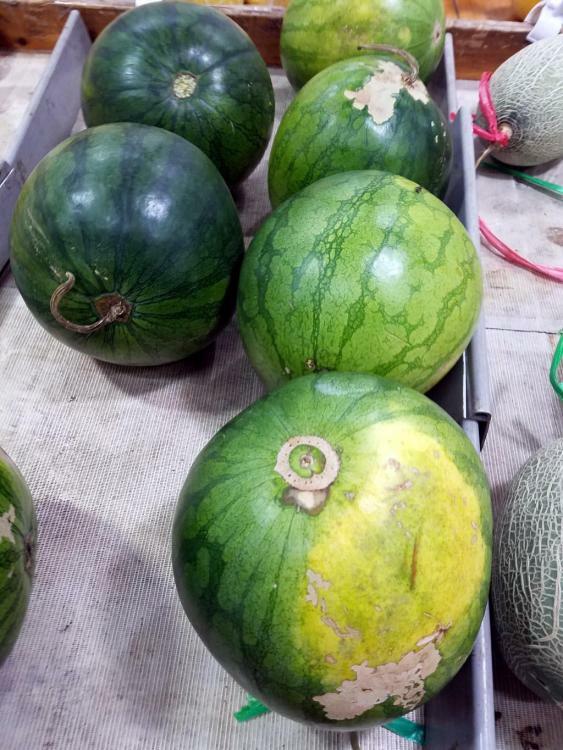 Are they the same as Korean melons? 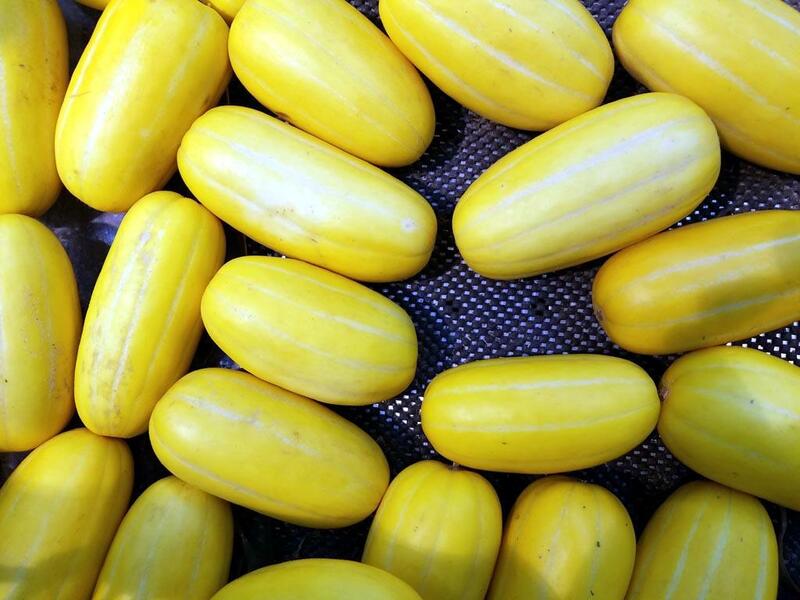 They are almost identical to cantaloupe melons. 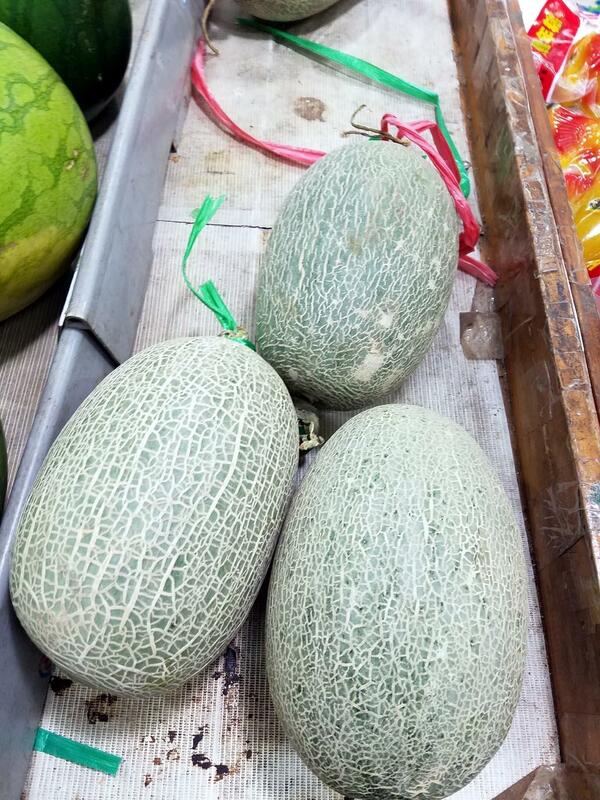 I've never had Korean melons. These are the dates that most of us see only in dried form?????! How are they? You are so lucky; I feel like I am in nature's candy store, vicariously.